What Are the Basics of the Russian Language? Before you begin working your way to foreign language fluency, it helps to understand the culture behind the language you’re learning. After all, language exists to help a group of people express their ideas and beliefs. Russia is a vast country with a rich history and culture. As you begin your Russian language program, gaining a strong grasp on this history, the values, and the etiquette will help you rapidly achieve success. In particular, there are certain basics to the Russian language itself that you should know. Among the most popular languages in Europe is Russian. It is a part of the Slavic group, particularly East Slavic, which also includes Belorussian and Ukrainian. Who Speaks Russian?Russia is the largest country in the world and has over 142 million people residing in it. All these people know how to speak Russian. Aside from the native citizens, there are also many other people who study the language and use it in conversations with their friends and family. According to data gathered, the estimated number of speakers of the Russian language is 255 to 285 million people. These speakers not only come from Russia but live in many parts of the globe as well. The majority of them live in the Russian Federation. Some of the countries with many Russian language speakers include those that were a part of the Soviet Union including: Byelorussia; Armenia; Estonia; Kazakhstan; Kyrgyzstan; Ukraine, and; Tajikistan. Meanwhile, statistical data also show that Russian is a common language for members of emigrant communities, such as those living in Israel, Canada, and the United States. Aside from these countries, Russian was also taught to students in Eastern Europe as required by the Warsaw Pact. Bulgaria, the German Democratic Republic, Poland, Czechoslovakia, and Romania were among those that were under the pact. Russian Language Ranking: As one of the official United Nations’ languages, Russian is indeed a widely spoken language around the world. It is considered a major language, just like English, Hindi, Spanish, and Chinese. It is the seventh most popular language in the world based on the total number of speakers, just right behind Malay. The Cyrillic alphabet has a rich history, which can be traced back to the 9th century. During that time, a missionary named Кирилл (Cyril), who later became a saint, created the first ever Slavic alphabet with the help of Мефодий (Methodius), his brother. The alphabet was known as Glagolitic, which was used to translate Greek text to Slavic. Later on, during the 10th century, the Cyrillic alphabet slowly started to progress. There were 24 letters borrowed from the Greek alphabet and there were also 19 that were specific to the sounds of the Slavic language. The Evolution of the Cyrillic Alphabet: ИванФёдоров, a publisher and a printer, reformed the alphabet in Russia. He removed the several variations of the letter O as well as the letters C and E. As changes were implemented, more and more people began to improve their knowledge of the alphabet. However, before the 18th century ended, a historian and writer from Russia, НиколайКарамзин introduced three more additional letters in place of the removed ones. These letters are Ё, Э, and Й. The additions were recognized and were finally a part of the alphabet during the same century. It was in 1708 when the Cyrillic that Russians are using now was first developed. Peter the Great who was the ruler at that time introduced the use of lower case characters. However, by 1919, authorities almost decided to replace Cyrillic with Latin. This way, it would be coherent with the alphabet in Western areas. Cyrillic Today: These days, Cyrillic is used as the official alphabet of the European Union, while Greek and Latin scripts follow behind. Over 50 languages use the alphabet today. Did you know that the Russian language beats other languages when it comes to expressing emotions? Many foreigners find Russian quite intricate, particularly when it comes to its construction. With a dramatic literature, unpredictability in pairs of verbs and prepositions, and richness in metaphors, it is easy to see why other people find learning Russian difficult. Despite all the wealth of words and complex structure, the Russian language sort of contradicts itself with “мат.” Simply put, it is a collection of words deemed as vulgar, profane, or obscene. The terms included in “мат” are commonly used by locals – even foreigners. With these words, it is almost as if you do not need to learn more about the language since they can help anyone express feelings, needs, and ideas – all with just ten swearwords. However, “мат” is not just about swearing. In fact, there are thousands of variations out there. Often, words from “мат” are used by scholars, philosophers, and all the intellectuals you can name as part of their rude humor. Even skilled managers, entrepreneurs, and CEOs use them as a way to relieve tension and stress. Of course, young people use “мат” slang for conveying exactly what the words mean. For others, the slang words are used merely to connect other words in a sentence. Although terms of “мат”can be derogatory for some individuals, not everyone uses them as a way to insult others. However, as you are still learning the language, do not go around saying the words to anyone – even as a joke – because doing so could land you in a lot of trouble. Wherever you go, the locals always appreciate it when foreigners know the simplest greetings. Of course, everyday phrases will also help you as you learn more about the place, the people, and the language itself. Do not smile too much when speaking, particularly when it is not called for by the situation. Always drop the tone at the end of the sentence, which makes the statement sound forceful, sometimes even aggressive. According to some Russians, Americans have a habit of smiling too much – often unnecessarily. With such a practice, they can easily trace that a person is not a native speaker. If you notice, discussions of the locals can seem as if they are arguing. Often, Russians talk fast and loud, making foreigners think they are involved in a heated debate. Whether it is the intonation or the language structure, learning Russian should not discourage you. In the end, it will be rewarding as you learn a new language and use it with confidence. 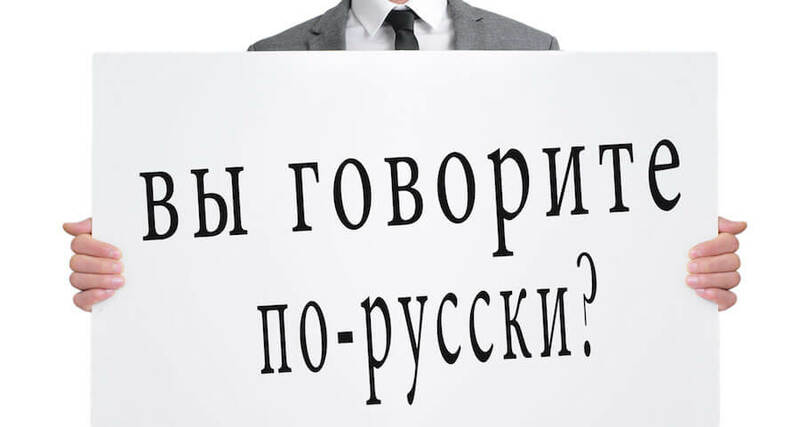 According to ROMIR, a Russian market research company, the percentage of Russians who speak English has doubled over the past decade. In 2003, only 16 percent of Russians spoke any English; by 2015 that number had nearly doubled to 30 percent. According to the survey, however, only three percent described themselves as fluent. English-speakers are more likely to be young city-dwellers; a lot of them live in Moscow or St. Petersburg. While most older people who grew up behind the Iron Curtain don’t understand English, many younger people have learned at least a little English. Most schools now teach English as a second language. Top-level business people often make a point of knowing at least some English. About half of the senior managers in Russia can understand and read English, and half of those can speak it well enough to use in business.